Joint diseases occur in people of all ages. And it should be noted that diseases of the musculoskeletal system “get younger” every year. More and more of young population is suffering from arthritis, and already almost half of seniors over 65 have this disease. Thus, the prevalence of arthritis today is enormous. In addition to such extensive prevalence, it is important to pay attention to the insidiousness of the disease. Many people are seeing the doctor too late, when the pain becomes unbearable, and there are restrictions in joint mobility. Arthritis is an inflammatory disease characterized by affecting the joint’s inner lining. Localization, origin and course of arthritis may be different, but always accompanied by pain, redness, swelling, and limitation in joint mobility, particularly expressed in the morning. Rheumatoid arthritis most commonly affects the elderly. It becomes the reason of inflammation of joints and tissues surrounding them. This significantly affects their function and quality of life. For the disease not to develop further, and for a person not to lose the ability to work, it is necessary to slow down the inflammatory process. So what rheumatoid arthritis is? Rheumatoid arthritis is known as an autoimmune disease in which the lymphocytes begin to struggle with own body. It is a chronic inflammatory damage of joints and surrounding tissues. Arthritis develops in connective tissue and causes erosive changes in it. After the inner lining of joints is inflamed, the joint liquid starts to be produced in them intensively. Eventually the joint becomes immobile and any movement results in acute pain. Sometimes there is a thickening of the joint, which is distributed to other tissues, ligaments are affected and a person may become invalid. Rheumatoid arthritis is the most common for women. Most often the disease affects the smokers. This disease may appear after earlier cold, after injury or if you have a source of infection in your body. The causes of the arthritis development in seniors are immunological and biochemical changes. Autoimmune changes occur in the connective tissue of joints. Regular hypothermia can also cause the development of rheumatoid arthritis. There are studies proving that there is some genetic predisposition to rheumatoid arthritis. Smoking and viral infections play quite a remarkable role in the development of the disease. 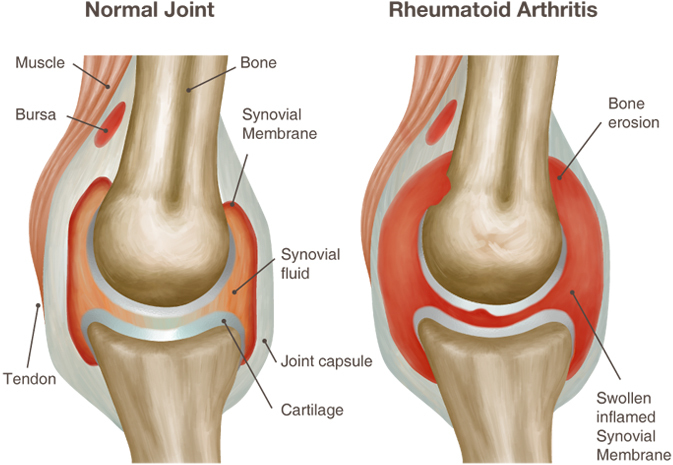 High physical loads on joints upregulate rheumatoid arthritis. For example, when the knees or other joints are often heavily loaded. During pregnancy a woman’s body has a double load, and this directly affects the joints. Rheumatoid arthritis affects whole groups of joints, polyarthritis develops. The joints’ lesion occurs symmetrically. Rheumatoid arthritis in the elderly differs from rheumatoid arthritis in other people by the fact that it always begins acute and all the symptoms are expressed brightly. After the development of inflammatory process, the joint pain appears, they start to swell. People start feeling joint stiffness. 7) training in nutrition, sleep and rest schedules. The treatment regimens are prepared by the doctor considering the possible risk of side effects and compatibility of medications. Any person, who has received a chronic incurable disease, can become depressed. But the sooner a person realizes that the power of will and thirst for life can work wonders, the quicker his condition will become easier. Rheumatoid arthritis is not a sentence, with proper treatment and appropriate psychological mood it is quite possible to live a full life with it. This entry was posted in Health and tagged arthritis, diseases, health problems, joints, physical health, rheumatoid arthritis on October 19, 2015 by admin.